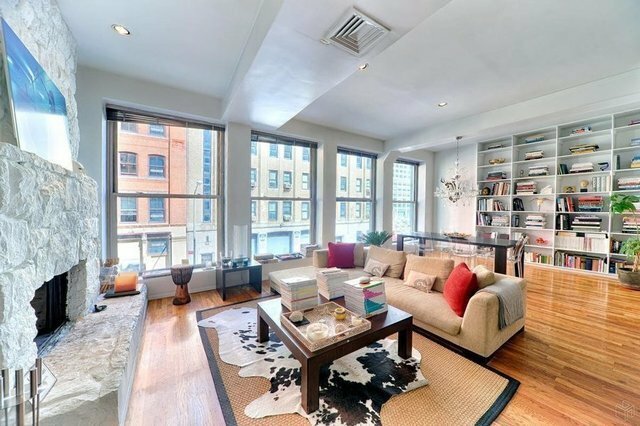 This chic, over-sized loft is located in prime, prime Tribeca! Accessed via a keyed elevator, the expansive apartment is facing due North with a wall of floor to ceiling windows. The gracious living room is centered around a charming fireplace and there's a dedicated dining area as well with an impressive book shelf wall that's perfect for showcasing you growing collection. You'll enjoy the fully modern kitchen equipped with stainless appliances and a 6 burner range stove. The stone counter tops offer plenty of prep space and there's an abundance of storage throughout the kitchen cabinetry. Bedroom is in the back, away from the street and totally serene. Large space with an abundance of closets and an over-sized bathroom with both a soaking tub and walk in shower. Additionally, the apartment has a washer dryer already installed as well as an additional storage space and central air conditioning. Large bedroom in the back of the apartment, does not have a window.